While we often post in response to Israel related news stories and commentary at the Guardian and ‘Comment is Free’ which are biased, misleading or inaccurate in some manner, often a Guardian ‘photo of the day’ can similarly serve as a vehicle for propaganda due to the emotive strength of the image, along with a paucity of relevant context. The following was included in the Feb. 11th edition of the Guardian’s ‘Best Photos of the Day’. Now, here’s what a Guardian reader casually glancing at the Palestinian “prisoner” wouldn’t have known. A friend who’s fluent in Arabic read the poster and identified the ‘prisoner’ as Ayman Ismail Al-Sharawna. He was sentenced to 38 years in prison, but released on October 18, 2011 as part of the Gilad Shalit prisoner exchange deal. On January 31, 2012, the IDF re-arrested Al-Sharawna, resident of a Palestinian town near Hebron, on suspicion of having returned to terror planning with a Hamas cell in the West Bank. He recently began a hunger strike. 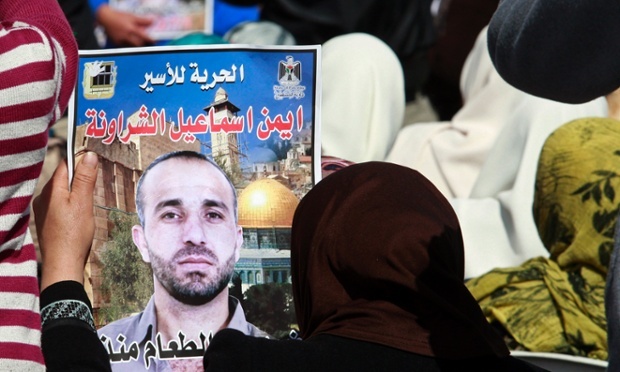 Al-Sharawna is a “prisoner” because he tried to murder innocent Israelis, and, after his release, is evidently determined to try to murder again. It’s amazing how a little bit of airbrushed detail when factored back in, changes the whole story. What CIF Watch did not mention: the REAL ‘prisoner of the day’ was prisoner X, who was buried alive in an Israeli cell, denied access to a lawyer, denied visits from his family, and whose very existence was censored by the military in blatant violation of freedom of the press. Does THAT disturb Mr Levick? Not for a minute, it seems. I recall the very same phrase from you re. CiFWatch allegedly not mentioning Gerald Scarfe’s critical cartoons of Assad. And CiFWatch certainly did mention said cartoons – as well you know. So basically: you’re a laughing stock. Quite right Pretz. The usual trolling diversionary tactics from Nat. And in addition, Nat has posted this very post, almost word for word, on the story on CifWatch about Prisoner X. So it is hard to see how Nat can use the “What CifWatch did not mention” lie again here and even pretend to retain any shred of credibility. If Nat were to claim that the Earth revolves around the sun, I’d have to check that out. YOu just forgot to mention that the Australian embassy in Israel knew of him being imprison as well as his family. Why were they quiet? Conflating two unrelated matters Nat that does not invite discussion That’s your style. Good bye. I wonder why they left out all that extra info? Oh, what could the reason be? Maybe its because the folks at the Guardian sympathize with Islamic terrorists killing Jews..
Effector (@Effec_Tor) I would going to write something, but you pretty much described the Guardian perfectly. That’s a seriously warped perspective. The depiction of this photo and the manner of it suggests to me that for the BBC/Guardian Al-Sharawna is a hero, a freedom fighter and someone to be admired. The fact that he wants to kill innocent Jews, women and children, does not matter to them. The Left believes that innocent civilians, if they happen to be Jews (or other non-Muslims), do not matter. To my mind, if Joseph Mengele had been imprisoned by the Israelis and if his relatives had been carrying similar placards, BBC/Guardian would have felt sympathy for the Doctor’s kith and kin. That’s the Nazi Left for you. June, STOP TRIVIALIZING THE SUFFERING OF MILLION OF JEWS DURING THE HOLOCAUST. Your trolling tactics are not going to work here. Stop trolling, and clear off. Surely Holland has other sites for you to troll? But they ARE working. They are getting all of you riled up which is part of this poor fool’s mental being in the world. His animus towards Adam himself is very clear and that itself indicates disturbance on Nat’s part. Adam, in what way precisely do “Nat” ‘s or his aliases’ contributions here further debate? We could manage very well without his questionable infantile contributions, couldn’t we? Defending the murdered Jews against living ones. Fritz, your comment made me want to throw up. HOW DO YOU DARE DISRESPECT THE MEMORY OF THE MILLIONS OF JEWS WHO WERE ASSASSINATED in the Holocaust? So, eat your own vomit, “nat”. You deserve it. One of the typical dirty tricks for the postmodern Antisemites is to misuse the murdered Jews against the living ones, you lowlifer. Fritz, HOW DO YOU DARE DISRESPECT THE MEMORY OF THE MILLIONS OF JEWS WHO WERE ASSASSINATED in the Holocaust? The family on my father`s side was almost extinguished by his nazi buddes. I would like to get his clear name to set the record straight, with nuttie the hisbollah darling. My family hid from the Nazis during WWII. That’s why I say that trivializing the Holocaust is unacceptable, especially at a time when the last survivors are dying, and when we need to keep watch and fight Holocaust denial. This is a serious matter, not something to trivialize. Your family, idiot, willingly cooperated with Nazis in the Netherlands. You were part of a network support Hilterism through and through. You were trolling then, as you are now. Must run in the family, I guess. Shut up, you Nazi, faking your history every half year. I promise you if I get your clear name you will get a personal history. No Nat. June is lampooning the Guardian’s adherance to propagating a lie and or misleading its readers into believing someone is innocent when he clearly has a lot of blood on his hands.. It’s not trivialising the Holocaust but expressing the point in such an absurd manner to make a point.about the guardian’s conduct. The only thing trivial here is your comment (as usual). Note the faceless, identity-less female holding the photo. Arnold Roth who lost his daughter in the Sbarros massacre in 01 to one of these Palestinian Nazis, wrote a great article about the Terrorstinians prisoners. The writer is a lawyer who made aliyah from Australia and lives in Jerusalem with his family. His daughter, Malki, was murdered in the horrific Sbarro terror attack. He says publicly – on US television, for instance – that he will kill more Jews when he gets the chance. More than that: he regrets that the bombings he carried out did not kill more Jews. In his own unforgettable words, “I feel bad because the number is only 66”. That photo…. it could easily be one of arch- taqiyya merchant, Tariq Ramadan, whose tenure at St Stephens in Oxford, was “encouraged along” no doubt by the Saudi money which was paid for various projects there. If they feel that DEATH is glorious that is their problem – It is no skin of my nose as long as they leave us alone- Who are they trying to impress by being so exuberant about killing children women old people ? If that is their desire It would really be a woth while sacrifice if their leaders show the way – The top echelon first and not the puppets .